Samsung Electronics (SEC) and LG Electronics (LGE) will introduce new smartphones. SEC will release the ‘Galaxy Alpha (tentative),’ a lineup different than the Galaxy S Series, and LGE will release the ‘G3 Cat.6,’ a broadband LTE-A product. According to industry insiders on July 13, the Galaxy Alpha, which SEC will launch next month, is a premium smartphone made of a metal. It is forecast to counter the iPhone 6 scheduled to be released in September. It appears that SEC will rebound from its recent poor performance with a new smartphone lineup, not the Galaxy S or Galaxy Note Series. The specifications of the new product are not known, but as it targets the iPhone 6, it is thought to have better performance than the Galaxy S5. The industry says it is very unusual as compared to SEC’s existing strategy of unveiling the Galaxy S in the first half and the Galaxy Note in the second half. Public attention is paid to whether SEC’s product release cycle will be changed in the future. LGE is scheduled to release the ‘G3 Cat.6,’ the broadband LTE-A version of the G3 within this month. The LGE Best Shop Online site, which briefly unveiled it on July 11, mentioned ‘Extraordinary compensation for used phones in celebration of the launch of the truly broadband LTE-A G3 Cat.6. Its price is not known. The broadband LTE-A is a technology for making a maximum speed of 225Mbps by integrating one 20㎒ wide broadband frequency with one 10㎒ wide existing LTE frequency with carrier aggregation (CA). It is 3 times faster than the existing LTE. Currently, the only terminal that supports the broadband LTE-A is SEC’ Galaxy S5 broadband LTE-A. Some foreign media predicted that the G3 Cat.6 would not be very different than the G3 except for the application processor (AP) in terms of design and performance. Meanwhile, as Pantech is also expected to release a broadband LTE-A smartphone as early as the end of next month, the competition for smartphone speed is forecast to intensify further. 삼성전자와 LG전자가 나란히 신형 스마트폰을 선보인다. 삼성전자는 갤럭시S 시리즈와 다른 라인업인 ‘갤럭시 알파(가칭)’를, LG전자는 광대역 LTE-A 제품인 ‘G3 Cat.6’를 각각 출시할 예정이다. 13일 업계에 따르면 삼성전자가 내달 선보일 갤럭시 알파는 금속 재질을 사용한 고급 스마트폰으로 오는 9월 출시될 아이폰6의 대항마 역할을 할 전망이다. 삼성전자는 갤럭시S와 갤럭시노트 시리즈가 아닌 새로운 스마트폰 라인업으로 최근 실적부진에 반전을 꾀할 것으로 보인다. 신제품의 구체적 스펙은 알려지지 않았지만 아이폰6를 겨냥한 만큼 갤럭시S5보다 높은 성능을 갖출 것으로 추정된다. 업계는 상반기 갤럭시S, 하반기 갤럭시노트를 공개하던 기존 전략과 비교하면 매우 이례적인 일이라고 평가했다. 향후 삼성전자의 제품 출시 주기에 변화가 있을지도 주목된다. 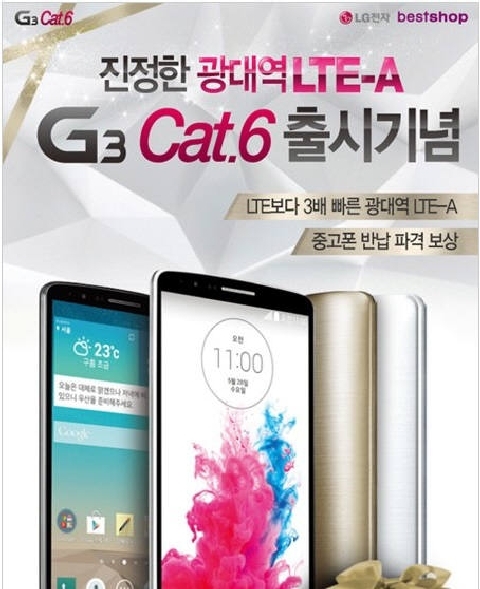 LG전자는 이달 내로 G3의 광대역 LTE-A 버전인 ‘G3 캣6(Cat.6)’를 출시할 예정이다. 지난 11일 잠시 공개됐던 LG전자 베스트샵 온라인 사이트는 ‘진정한 광대역 LTE-A G3 Cat.6 출시 기념 중고폰 반납 파격 보상’이라는 내용을 담았다. 제품 가격은 알려지지 않았다. 광대역 LTE-A는 광대역 LTE-A는 20㎒ 폭 광대역 주파수 1개와 10㎒폭 기존 LTE 주파수 1개를 주파수묶음기술(캐리어어그리게이션?CA)로 통합해 최고 225Mbps 속도를 내는 기술이다. 기존 LTE보다 3배 빠르다. 현재 광대역 LTE-A를 지원하는 단말기는 삼성전자 갤럭시S5 광대역 LTE-A가 유일하다. 일부 외신은 G3 Cat.6가 애프리케이션프로세서(AP)를 제외한 디자인과 성능 면에서 G3와 큰 차이를 보이지 않을 것으로 예상했다. 한편 팬택도 이르면 내달 말 광대역 LTE-A 스마트폰을 내놓을 전망이어서 스마트폰 속도 경쟁이 한층 치열해질 전망이다.